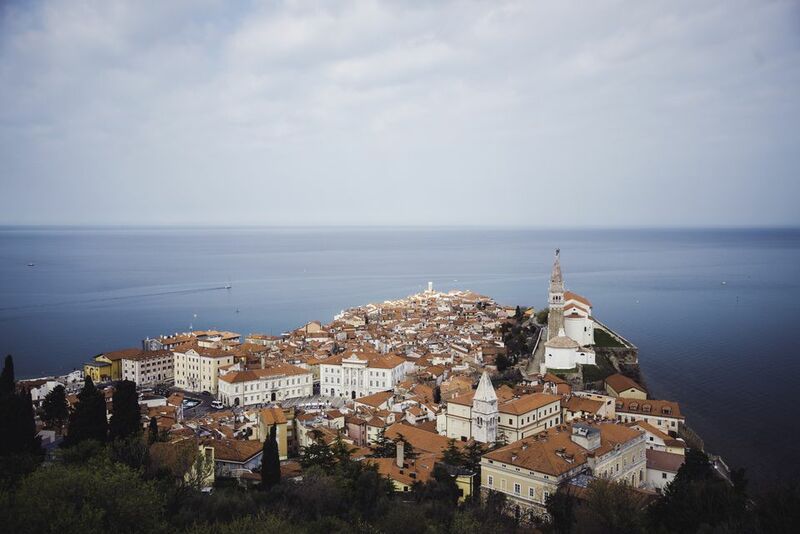 If you're heading to Slovenia for the first time, you might be interested in learning more about the most iconic parts of Slovenian culture. Here are a few of the cultural elements that make Slovenia stand out. The flag of Slovenia is a tricolor flag featuring white, blue, and red horizontal stripes. The flag also contains the Slovenian coat of arms in the upper left corner. The Slovenian coat of arms displays Slovenian Mount Triglav and the Adriatic Sea. Mount Triglav is an important national landmark. Visitors to Lake Bled can see this three-peaked mountain as a part of the natural landscape of the area. Slovenia's connection with the Adriatic Sea is also important. However, its coast is only 42 kilometers long! The traditional dress for a Slovenian woman consists of a shirt (usually white), skirt, apron, headscarf, and white socks, and may include a belt and scarf or a sash. As in other Eastern European national costumes, the Slovenian traditional dress varies by region. Folk costumes in Slovenia are most widely used for festivals, contests, or on holidays. Dancers wearing traditional dress also perform as a way to preserve and share Slovenia's culture. The male version of the traditional Slovenian costume consists of a white shirt, vest, cropped pants sometimes made of leather, white socks, leather boots or shoes, and sometimes a pocket watch. Different styles of hats can also be worn, depending upon the region where the costume originates. Used during festivals and holidays, traditional Slovenian dress preserves an important cultural tradition. Sometimes, instead of boots or regular shoes, a Slovenian traditional costume will feature opanke, or leather sandals. These leather sandals are from Slovenia, but other Eastern European cultures have also developed traditional footwear in the style of leather sandals. Visitors can sometimes find opanke-style shoes in markets. Lace from Idrija, Slovenia, is a special craft that has been practiced for several centuries. Idrija lace has been trademarked, and the tradition is being carefully preserved. The bobbin lace-making technique has been used in Idrija and elsewhere in Slovenia to create sellable products, and this lace can be used to edge cloth or as decoration in itself. Painstaking lace-work and other handcrafted items are special treasures that souvenir hunters shouldn't pass up - many traditional crafts are rare due to the shrinking population of artisans who practice the techniques necessary to create them. Weddings are sumptuously celebrated in Slovenia. One wedding tradition in Slovenia is the baking of the customary wedding bread. This loaf, usually made of braided dough, is decorated with beautiful cutouts or paper flowers. The style of the bread may vary by region and by family custom. Gibanica is a traditional Slovenian pastry that is either rolled or layered, and can contain a combination of raisins, cottage cheese, poppy seeds, nuts, or apples. Gibanica, or versions of gibanica, are also prepared in other Southeastern European countries like Serbia and Bosnia and Herzegovina. Lipizzaner horses are the only breed of horses to originate from Slovenia. The breed was developed out of a Lipica stud farm in the later half of the 1500s. The Hapsburg Empire required horses that would be both sturdy military animals as well as ones that would appeal to the fashionable riding schools of the day. Today, the Lipizzaner horse is a national symbol of Slovenia. Visiting the Lipizzaner stables and watching the horses perform is a popular tourist activity and is sometimes included on group or organized tours. Dragon Bridge in Slovenia's capital city, Ljubljana, is a familiar site to travelers. The dragon has long been a symbol of Ljubljana. The origin of this city's symbol can be traced to the myth of Jason and the Argonauts, who supposedly encountered the Ljubljana dragon on their way to the Adriatic Sea by way of the Danube and Ljubljanica Rivers. Lake Bled is a popular tourist area for locals and international travelers to Slovenia. Bled Castle, a much-visited attraction, is built on a cliff overlooking the lake, and is one of the oldest castles in Slovenia, dating back to the 11th century.